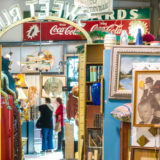 20,000 square feet with 200+ antique dealers and consignments - everything from A to Z! Plenty of parking even for RVs! Open daily 9am-6pm.